You want to see pictures of rock stars? You want to hear great stories from world-famous photographers? You want to own a great coffee-table art book? Go get your hands on Who Shot Rock & Roll: A Photographic History, 1955-Present. This heavy hardcover is 3oo pages plus of amazing photos of music stars, from Elvis to The Clash, Bruce Springsteen to James Brown and Beatles, Beatles, Beatles (in fact in the page ‘intro’ there is extensive coverage of the “Fab Four” more than on any other artist) and brief bios of the people who took the pics. It’s those bios and stories from the photographers I enjoyed the most. Most of what editor/writer Gail Buckland has collected and comments on are the simple yet amazing portraits of rock and roll and R&B stars backstage, on stage, in the studio or posing at cafés with brief snippets of the photographer’s backgrounds under the mostly black and white pictures. Occasionally though she has great comments from the likes of Storm Thorgerson, partner/photographer/designer of the company Hipgnosis, famous for (among others) Pink Floyd’s iconic “Dark Side Of The Moon” album cover. A guy like Storm has got great stories and he reveals a few in this book. Then there’s a fantastic snippet of photographer Ed Caraeff’s ‘accidental’ shooting of Jimmy Hendrix lighting his guitar on fire at Monterey (five panels of this sequence published her for the first time here) Barry Feinstein’s photos of Bob Dylan’s England trip and the story of the controversial Blind Faith album cover. There’s photos of and interviews with such notables as Richard Avedon, Annie Leibovitz Bob Gruen and even a feature on Dennis Hooper (a forgotten yet great photographer in his own right) and an “Album Cover Chronology (1954-2009)” section at the end of the book reminding us what pieces of art album covers were. We learn of those long-ago beginning years of rock and roll when a publicist or some other record company officer worker would simply pick up a camera and take shots of a soon-to-be rock star, then suddenly find him or herself a whole new career and inventing an aesthetic for this kind of photography. 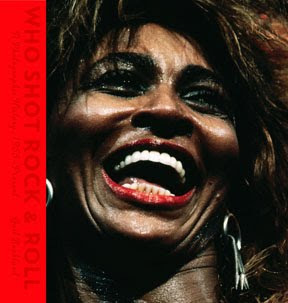 Who Shot Rock & Roll: A Photographic History, 1955-Present by Gail Buckland is a great book for rock and roll fans, photographer students or anyone interested in popular music history.